I used to have this friend who was always wary of being around people who were not speaking English. She was always convinced they were talking about her. I mean, clearly that was just her being paranoid (except when those folks really were talking about her), but I gotta say, I kinda have the same wariness when it comes to buying anything that's supposed to be my name in another language. You just never know if it really says Joy. For example, I once compared the character on this JOY magnet to the other stuff that my friends and I brought back from Hong Kong. 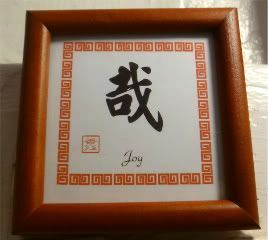 Between this magnet and the JOY ink stamp they brought, plus the JOY I had etched into an ivory pendant, I could swear, it's never the same character. And I'm afraid to check the special art frames at Target or Bed Bath or anywhere else, because who knows if they really match JOY, either. You could argue that it could be several different languages and/or dialects that are being used, I suppose. Mind you, I don't really care. Honestly, if it has my name on it, I totally buy it anyway. I'm just sayin' if you see my name in another language, and you know for a fact that it doesn't say what I think it says...don't tell me.